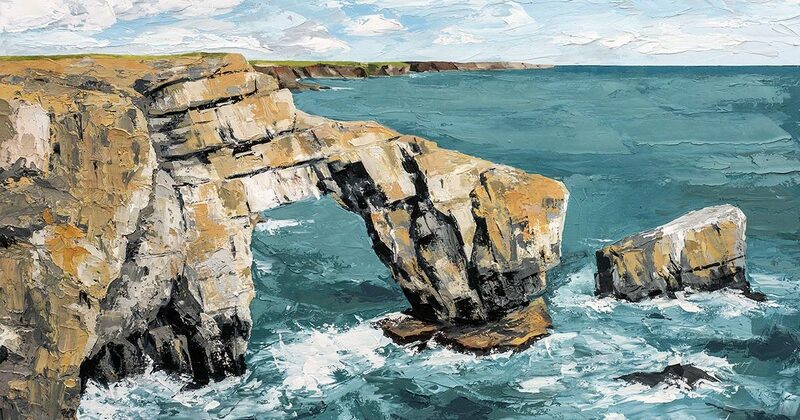 The south coast of Pembrokeshire is known for its dramatic rock formations, and none is more dramatic than the Green Bridge of Wales, a sea arch extending south into The Wash bay. The Green Bridge of Wales is a limestone arch and it is the limestone of the South Pembrokeshire Coast that is responsible for some of the most beautiful natural features. My painting depicts a memorable view of the natural arch with the deep blue sea highlighting its rugged and distinctive features. Within days of completing the painting, a large chunk of the outer wall fell into the sea following the recent Storm Ophelia and this changed its unique profile forever. This great icon will remain as I remembered it.